The Comprehensive Parasitology profile is an important tool for identifying imbalances in intestinal microflora. It includes comprehensive bacteriology and yeast cultures to identify the presence of beneficial flora, imbalanced flora including Clostridium species, and dysbiotic flora, as well as detection of infectious pathogens and evaluation for the presence of parasites. A good balance of beneficial micro flora has been known to be associated with health benefits since the turn of the century. At that time Metchnikoff drew attention to the adverse effects of dysbiotic gut microflora on the host and suggested that ingestion of fermented milks ameliorated what he called “autointoxication”. He proposed that the consumption of large quantities of Lactobacillus Acidophilus species would reduce the number of toxin-producing bacteria and result in better health and increased life span. Over the past 90 plus years there has been extensive scientific research demonstrating that a good balance of Lactobacilli, Bifidobacteria and beneficial E. Coli bacteria are important to the functional health of the gut, and as a consequence, to the whole organism. The benefits identified include inhibition of microbial pathogens, prevention and treatment of antibiotic associated diarrhea, prevention of travelers’ diarrhea, reduction of lactose intolerance symptoms, reduction in serum cholesterol levels, enhancement of the immune system, and inhibition of the proliferation of Candida albicans. Research has shown that improved biological value of food can be achieved through the activity of probiotics Lactobacilli and Bifidobacteria which have been reported to produce folic acid, niacin, thiamin, riboflavin, pyridoxine, biotin and vitamin K.
In a healthy balanced state of intestinal flora the beneficial bacteria make up a significant proportion of the total microflora. However, in many individuals we see an imbalance of beneficial bacteria and an overgrowth of non-beneficial or even pathogenic microorganisms (dysbiotic). This can be due to a variety of factors including: daily exposure to chemicals in our drinking water that are toxic to friendly bacteria; the use of antibiotics; chronic consumption of highly processed foods ( low in fiber, high in sugar) and high stress levels. Patients may present with chronic symptoms such as irritable bowel syndrome, leaky gut, autoimmune diseases (e.g. 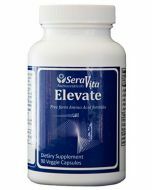 rheumatoid arthritis), fatigue, chronic headaches, and allergies to a variety of foods. Identification of abnormal levels of specific yeast species in the stool is an important diagnostic step in therapeutic planning for the patient with chronic gastrointestinal and extragastrointestinal symptoms. 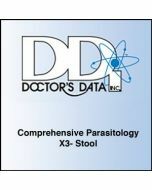 The Comprehensive Parasitology x3 stool test by Doctors Data is performed to identify abnormal intestinal parasites and microflora, but does not directly assess abnormal digestion/absorption, inflammation or other specific aspects of gastrointestinal health. This easy to use test kit by Doctors Data is sent to your home. The kit contains everything needed for collecting specimens, including shipping materials and pre-paid postage for sending specimens to the lab.